We told Louis we'd meet him at 8 am at Mother's Restaurant. I'd found it before the trip and John had sent the address and map to everyone, and it was only three four blocks away from our hotel. Everyone else had gone Friday night and Lysa and Jeff had gone there again Saturday night, and hadn't eaten at Mulate's. *laughs* It was a very popular restaurant for everyone as the prices were mildly more reasonable than the rest of the city's restaurant prices, and the food was just really, really good. I hadn't known it, but it has also been featured by Food Network and on Saturday the place had been so packed at 11am and at 3pm that folks had had to wait an hour to get in. We got a call from him that he wouldn't be making it, it was only later that we realized that it was because the flu had hit him pretty badly. Originally uploaded by Liralen Li. The process was pretty simple. You line up for the ordering cashier, you order your breakfast. If you get coffee, they hand you a mug with your cream or without, and you get to add your own sugar, then you sit down and put your receipt out and one of the servers picks up the receipt. Now he knows where you are and no one has to shout out any names that anyone has to listen to, he just brings you the food when it's ready. We'd seen the hams the night before, and while we'd been told about the glories of the "debris", which was the stuff that had fallen off the roast beef and possibly the hams as well while it roasted into the roasting juices, I really wanted what they called "the black ham", which is the outer, glazed crust of the roasting hams. So we got the breakfast special that had our choice of meat, grits, two eggs any way, biscuits, and our big, utilitarian mug of coffee. It was glorious. The black ham was crisp, sweet, and tender on the inside and really great with the grits, which were so creamy they needed no butter to make them seem better. My over-medium eggs were firm all the way through in the whites and creamy of yolk. And the biscuits... gosh, the biscuits were tender, fluffy, and served with a big blob of jelly and butter. They were just amazing with the hearty, fresh, hot coffee. From there, we went back to the hotel and I spent the morning, until 11, taking advantage of the hotel's wireless service to get the previous day's adventures written, at least. I've now added some pictures and things to Saturday. The amusing thing was that there were over two dozen unsecured wireless services available from my room, from neighboring hotels, the NOLA city wireless, and three commercial services as well. John went and wandered and shopped for some pralines for me to bring home for Jet. At 11, which was the checkout time, everyone met at the front desk and found out that Louis was missing. He'd extended his time with the hotel, and they ended up letting him stay until 4, and since he was one of the drivers, he decided he just had to make it to the airport at that time. Which was a pretty good incentive for him. Two car loads decided to just stay around the French Quarter. One to stay until it was time to go to the airport, the other just for a few hours and then would go driving out to the levee break areas. My carload decided to try and see the Garden District, a graveyard, and some other sites before hitting the more areas we had seen last year. We found bits of the Garden District still in Mardi Gras colors. There were beads still in the trees, decorations in purple, green and gold in the fences and bushes and alongside houses. There were houses like this one still in full regalia, a bit like Christmas decorations left out even after the season. That was really cool to see, all the traces that normally wouldn't have been around were now there in bright colors everywhere. And this with Fat Tuesday nearly two weeks ago. We drove up and down the quiet streets, admired the huge houses, and noted only a few had not been repaired, only one or two not lived in, as might actually be normal for any neighborhood. There had only been hurricane damage here, not the extent of flood damage that covered 90% of the city. So it was nice to see a great neighborhood full of people home for a quiet Sunday or in their Sunday best, going off to church or coming home from it. It was nice to see something whole again, with people washing cars, chasing dogs, mowing the lawn. And the flowers were out, all kinds of flowers, and I envied, terribly, the folks with tulips, pansies, and other flowers in full bloom. 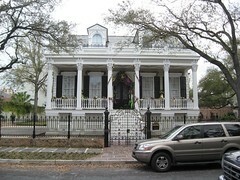 We also admired the live oak trees spread over the streets. From there it was a short jaunt to a graveyard that John found on the map, and it looked like four yards fenced in with hurricane fencing. 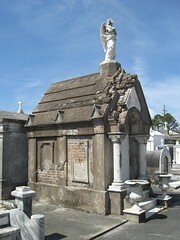 Three of which had vaults, mausoleums, and graves built above ground on them. Mostly in marble, some more ornate than others, some far more ancient than others. They went back into the late 1800's, some of them, and we only looked in one of the three occupied yards. This soul is found in peace. There were candle holders everywhere, and some fallen name plaques and vaults that were covered in plywood or cement as stop gaps, but it had all been cleaned and taken care of as best they were able. There was a quiet piece to the place, which I hadn't expected. A touch of what I'd felt when I'd dressed up to go see Bruce Lee's grave in Seattle with friends, it had started as a lark, but... there's a sense of reverence in those places, of a hoped for rest and peace. It was fun to discuss with the older members the fact that they didn't want something like this, they'd rather be cremated than leave something like this for someone to maintain forever. 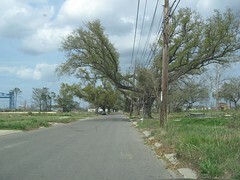 From there we headed to the Lower 9th Ward and found that Mr. Pitt and his crews had been busy. The funky green houses of "9 Make It Right" were in rather glaring contrast to the more traditional houses. They are beautiful houses, no doubt, and probably better for the environment, better for the people living in them, and better for the future. And they all have their own personality, no doubt. Last year, in the whole area, there had been two, maybe three new houses, now there were twenty or so. Still, the vast majority of the place still looks like this. Houses every 20 feet... now nothing but concrete pads, there were small clusters of three or so houses at once, most of them the traditional little houses in pale mint colors; but they were frighteningly alone in that vast field of recovering trees and waist high grass. It was pretty obvious that even if some folks had stayed that they weren't going to have all their neighbors back any time soon, or even new neighbors back so very soon, either. But there were a few older houses that had survived, structurally, and they'd been gutted and were being worked on, most in the shelter of the far ends of the field, the furthest away from the now whiter levee sections that are new. We saw the one house we saw last year, off by the banks of the Mississippi, and now there were two houses with just frames and boards partially up next to that one. I guess that's progress, and there are tours of that house every day except Sunday. But I got three gorgeous strings of beads out of it, and I'll say again, that it's nice to be lucky, sometimes. St. Bernard's looked a lot like it had last year. A more upscale neighborhood, it had still been devastated by the levee breaches, and there was more insurance money and more money in general there to rebuild, but the neighborhood is still less than half there. There were For Sale signs out now, on buildings that have obviously been gutted and are ready to be worked on; but someone finally gave up the fight, and wants out. I don't blame them. Nearly everything left there, now, are brick buildings, between the concrete pads. But there were people out just enjoying their Sundays there, too. From there we headed to the airport, got to the rental car place in plenty of time, got everyone checked in, and found that our plane was at least half an hour late, and then upwards to an hour late. 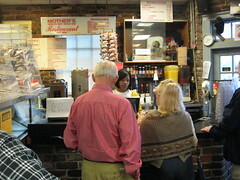 We spent a lot of time at the Oyster house outside of security, drinking beer or coffee or water, and munching on various types of food. There was no use rushing, and the security there was quick and there weren't long lines. The flight was fine. I got to finish a fingerless glove while sitting there. I hadn't gotten to knit all week because I was driving when I was knitting last year. The driving crews were all set for us, and as soon as we were at the pick up area, they were there, and I got to sit back and relax while someone else drove. George met us at the church, and we went home. Isabel had waited up for us, and it was nice to hug her again. Jet was fast asleep, but he'd wanted a goodnight kiss, so we kissed him even though all he did was sigh and turn over in his sleep. I was so tired I just hauled everything up to the bedroom and got all my medications and bathroom stuff settled, and just fell into my bed, and was very thankful to finally get into my bed. Glad that you're back safely, and very glad that you had a good time! And, it was a very good time. Whew. Welcome home. Thanks for sharing the stories. I have to do a bunch of short stories that I'd left out in my rush to right every night... *laughs* But I think I'll just do that next, and it'll be with the collection all at once. But thank you! I'm very glad to be home. Whew. I'm so glad you've had a chance to do some cool stuff as well as work and deal with sick people. What does Jet think of it all? Jet's very happy to have us back, he's pretty much inseparable from me at the moment, which is to be expected; but there's no reproach from his part. He understood why we had gone and he'd even worked at the fund-raiser. But he got to plan a celebration evening last night for everyone, and he picked Noodles and Glacier Ice Cream and enjoyed it a great deal and just was pretty clear that he was glad we were back. What a lovely way to leave New Orleans. I can still remember it like it was even so many years later. It was hard to look at your pictures of the "fields" of foundations. I often wonder how anyone would go back to the stark reality of that and the possibility that it could happen again. Yeah... it is hard to look at that... and I can't imagine going to *live* in the field and remembering all the neighbors that are gone any more than the electrician in Biloxi where four of his neighbors died in the storm surge. Must take deep roots to go back and stay in the midst of that. Yes. It was very... right to kiss the kiddo even though he wasn't conscious. *grins* I think it is an imperative of that order.